Utes in review: Three freshman totaled 40 points vs. Washington State. How will their growth frame this season? Timmy Allen, Both Gach and Riley Battin will have a lot to say about how the program is judged. 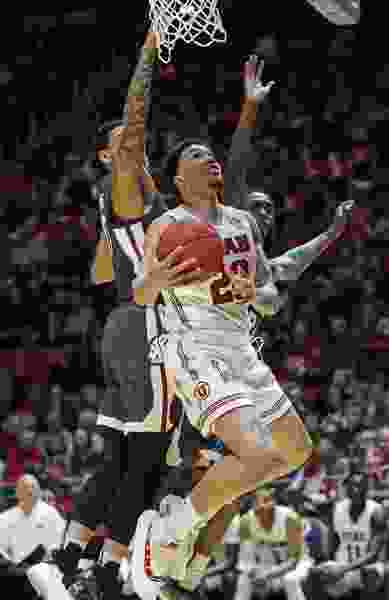 (AP Photo/Rick Bowmer) Utah forward Timmy Allen (20) goes to the basket as Washington State's Isaiah Wade, left, and Viont'e Daniels, right, defend during the second half of an NCAA college basketball game Saturday, Jan. 12, 2019, in Salt Lake City. Utah coach Larry Krystkowiak never wanted his team's youth to remain the dominant story line of this basketball season. At some point, that theme may be all the program has in its favor. Ute freshmen Timmy Allen, Both Gach and Riley Battin produced 40 points Saturday in an 88-70 defeat of Washington State, Utah’s 10th-straight win over the Cougars. The question going forward is how much those three have to keep improving for the season to viewed as satisfactory. Krystkowiak hoped inexperience wouldn't become an excuse for a losing record, and he wanted Sedrick Barefield, Parker Van Dyke and graduate transfer Novak Topalovic to maximize their senior years. Yet the reality is that a .500 record, even in a downtrodden Pac-12, looks like an achievement for Utah (8-8, 2-2) with 14 games left in the regular season. So the fan base's degree of belief in Allen, Gach and Battin certainly will play into the judgment of the program. In Thursday’s 69-53 loss to Washington, Allen had turnover problems, Krystkowiak blamed Gach for allowing the Huskies’ David Crisp to make four 3-pointers in the first half and Battin was replaced in the starting lineup at halftime. They all played better Saturday against a WSU team missing top scorer Robert Franks. “The more experiences these guys have, the more they’re going to mature and be able to deal with some of those things,” Krystkowiak said. • Nobody could say the Utes played up or down to the competition this past week. They were overwhelmed by Washington, the Pac-12′s highest-ranked team (No. 44), according to the kenpom.com efficiency analytics. And they routed the second-worst team, missing its best player. • Nothing will be this easy in the remaining two months of the regular season. California is worse than WSU, but Utah plays the Golden Bears just once, in Berkeley. Stanford, another road-only opponent, is improving and WSU presumably will be healthy when the Utes visit Pullman in late February. ESPN's Basketball Power Index projects 7.3 wins for Utah in the 18-game conference schedule, resulting in a 13-17 overall record entering the Pac-12 tournament. • Good news: Krystkowiak is as tired of turnovers as everybody else who watches this team. The Utes commit every imaginable kind of turnover: bad passes, fumbled passes, offensive fouls, shot-clock and backcourt violations and stepping out of bounds. The fumbles are especially frustrating, and Krystkowiak made some immediate substitutions in response Saturday, as “one of the best leverage weapons we have as a coach,” he said. The strategy didn’t help right away. The Utes committed their average of 16 turnovers in Pac-12 games; they’re second to last in the conference in that category. Allen. The forward averaged 11 points, 10 rebounds and three assists in a week spoiled only by his seven total turnovers. He’s a clever playmaker in the lane, but his passes don’t always connect. Even so, Allen is the most consistent player among Utah’s freshmen, if not the whole team. Van Dyke’s steal and two-handed dunk against Washington State, the first of his college career. “I couldn’t believe it,” Krystkowiak said. “I’ve had opportunities before ... I thought, ‘I’m a senior, might as well throw one down,’ ” Van Dyke said. The Utes will have their first meeting with travel partner Colorado next Sunday at the Huntsman Center. The Buffaloes (10-6, 1-3) lost 77-70 to Washington on Saturday, after trailing by one point with 7:14 remaining. Colorado guard McKinley Wright IV left the game with a shoulder injury in the first half.